Digital billboards have revolutionized the billboard industry. Unlike the traditional billboards, digital billboards are able to display several ads in a matter of seconds. Furthermore, they create eye-catching visual effects that aren’t possible on traditional billboards. The technology behind digital billboards wasn’t widespread until the turn of the 21st century. That’s because the expense of the electronics made it too expensive for most billboard advertisers to adopt. However, advancing technology and lower electricity costs eventually won the day. Fun fact: Lamar Outdoor Advertising was the first to install a digital billboard in 2001. The entire billboard wasn’t entirely digital but was still groundbreaking for its time. Four years later, the market for digital billboards officially boomed. Even though digital billboard technology is fairly new, the technology is relentlessly pushing on and even the first Lamar billboard looks archaic compared to today’s different types. Here are some of the different types of digital billboards that have evolved over the last decade. Digital signs are a good option for outdoor advertising for spaces that don’t require a standalone billboard. Digital signs can take the place of traditional store signs, mounted on the side of the building, at the entrance to a parking lot or underneath an existing sign. Digital signs allow buildings to be seen from the roadway, increasing the flow of foot traffic. Digital signs are attractive for their versatility and relatively low cost. For shopping plazas and marketplaces, this makes economic sense as several digital signs can be mounted, each showing a different advertisement at regular intervals. Digital billboards mounted on mobile trailers are an excellent option for tailgates, conventions, markets and more. This type of digital billboard is attractive because it can be moved to multiple locations with relative ease. Current technologies allow these mobile options to be seen from 100 feet away, making a perfect eye-catcher for marketing at crowded outdoor locations. It’s important to note that these cannot be operated while in motion. Digital billboards are a common sight along the freeways of the world. These brilliant displays can be seen for a mile away on lonely American roads at night, warning travelers of food, retail locations, and local sights along the way. Furthermore, they are popular in metropolitan cities like Los Angeles and most famously, New York. Brightly colored digital billboards display posters, marquees, videos, and advertising campaigns over Times Square. Digital billboards are a popular option for most businesses, with LED capabilities not only offering multiple vivid design options but also effects that are visually engaging. Digital capabilities also offer the opportunity for high-resolution images, video, and effects. Smart billboards can be implemented anywhere, and are truly the future of digital advertising. From billboard advertisements that are activated when a car is a certain distance from the board via sensors, to a unique “coughing man” advertisement recently used in Sweden. Through the means of smoke detectors in the billboard, a man will appear and begin coughing as if from the secondhand smoke. Then an antismoking campaign begins to play, as well as ads for nicotine patches and other smoking cessation assistance. Other examples include facial recognition technology and interactive features that enable games to be played. Smart Billboards are a dynamic form of digital billboards that allow passerby to interact both with an advertisement and its parent brand. In addition, smart billboards can be erected anywhere, from bus stops to shopping centers and anywhere in between. A company on Shark Tank is working on introducing technology to play digital advertisements on parked car windows. 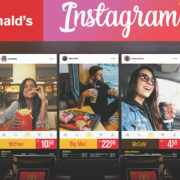 A passerby walking the streets will see targeted advertisements projected onto stationary car windows Though this type of digital advertisement is not available yet, test market runs in several prominent American cities indicate this could be the latest wave of the future. This is an example of utilizing passive platforms to create targeted messages. Furthermore, it is part of the ingenious wave of high-tech advertising that pushes the digital billboard industry forward at breakneck speed. It’s been a big year for Ford, in more ways than one! 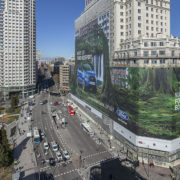 In February, the vehicle company unveiled a record-breaking billboard in Madrid, Spain. The installation featured an advertisement for the new Ford EcoSport SUV, but that wasn’t what made it such a huge deal. The billboard measured approximately 56,672 square feet square feet, making it the worlds largest billboard. It was awarded the official Guinness World Record for Worlds Largest Billboard soon after installation. The previous record had been set four years prior, in 2014. An official Guinness Records judge confirmed the measurements in February and certified the EcoSport installation as the record-holder for worlds largest billboard. Engineers mounted the billboard on the front of the magnificent Edificio España in Madrid. The building is the eighth tallest in all of Madrid. It accommodated the huge billboard — which was the size equivalent of 20 tennis courts– for most of February. Engineers removed the 4,409-pound billboard at the end of the month. However, all that effort wasn’t wasted. Ford then donated all materials used on the billboard to the Apascovi Foundation. The foundation is renowned as an employment center for people with disabilities. The center will repurpose all donated materials used in the construction of the worlds largest billboard, giving the achievement a second life. The decision to design the largest billboard in the world which was enough to sweep the Guinness World Record was inspired by Ford’s famous tagline, “Go Further.” In tandem with the unveiling of their new EcoSport SUV in the European market, Ford decided to take their famed motto literally. The company aimed to “go further” figuratively and literally. In fact, Ford went further than the previous record holder by over 2,000 feet. The Edificio España is one of the most iconic buildings in Madrid. It was finished in 1953 and is a stunning neo-baroque building. It also was a record-holder in its own right, reigning as Madrid’s tallest building until 1957 when it was overtaken by the Torre de Madrid.The Ford billboard wrapped around the impressive facade of the building. It has stood empty for several years, with plans for the enormous structure to be refurbished into a luxury hotel with 650 rooms in 2019. Although Ford wanted to advertise its brand new EcoSport SUV, it also wanted to beat the previous record holder. Surprisingly, however, the record wasn’t held by an automotive competitor. Instead, Ford found itself competing against popular electronics maker LG. The LG cell phone company partnered with King Khaled International Airport in Saudi Arabia to build the previous record-holding billboard. It was unveiled at the airport in Dhahran in 2014. An official Guinness World Record judge then certified the amazing feat. LG’s billboard took an incredibly long time to commission and build. Engineers constructed the previous worlds largest billboard over three months. Construction took nearly 12,000 labor hours. When the billboard was finally erected, its official measurement was 32,291 square feet. The Ford billboard towers over the Dhahran installation by over 2,604 square feet. Competition in the auto industry is particularly fierce. Advertising experts agree that the next record seeker looking for bragging rights on the worlds largest billboard will most likely come from one of Ford’s competitors. Billboard wars in the auto industry are particularly fierce and common. Several have made headlines, such as the decade-long billboard war between automakers BMW and Audi. It wouldn’t surprise anyone if either of the two auto titans decided to try for the record next. However, the American auto manufacturer can be proud to hold the largest billboard in the world record for at least a few years. Particularly in a time of reorganization for the company, the achievement is incredibly important.